Are you a yelling mom? In this week’s episode, we talk about how to handle negative emotions. We all get angry and we all get frustrated sometimes, but the ways in which we express these feelings can have a lasting impact on our families and relationships. Instead of yelling, complaining, whining, and crying, lets discuss positive outlets for negative feelings. First, it’s important to assess your life and get a perspective on whether you have a fallen into a bad habit with regard to expressing negative feelings. It’s also important to look for appropriate ways to vent and have positive outlets for physical, creative, and emotional energy in your life. With proper balance, you can avoid becoming overly frustrated and angry and stop lashing out at others unfairly. It’s also important to talk about what our long-term parenting goals are, and whether or not “yelling” is moving us toward them. As hard as it sometimes is, getting our kids to listen and obey the first time we tell them something is a worthwhile investment of time and energy that pays off in the long term. This week’s interview guest is Karen Edmisten, a mom, wife, author, and convert from atheism. Karen shares some of the beautiful ways that God has touched her life and shaped her motherhood and writing career over the years. This week’s Girlfriends Shout Out goes to Roseanne Denardo who wrote to share with me some success she’s been having with her goal of losing weight and becoming healthier in 2016. Way to go, Roseanne! And finally, this week’s challenge is to approach the coming week with a greater sense of awareness of the ways that you respond to negative emotions in your life and in your relationships. Pick one time when you are tempted to respond in a hurtful or unhealthy way and replace it with a positive intervention. Go you! We got this! Thanks to listeners RCathgirl and NEKMelissa for reviewing Girlfriends on iTunes this week. 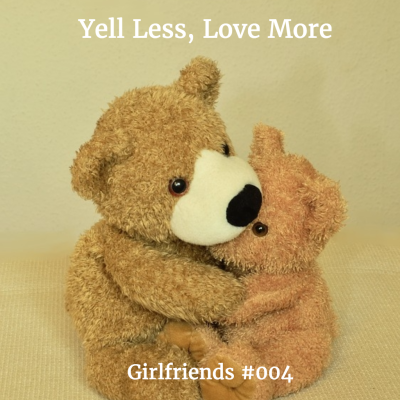 I would love it if you would consider doing the same, rating and/or reviewing Girlfriends in iTunes to help me get the word out about this new podcast. And thanks, as always for listening. I’m so glad you’re here! Know your worth, find your joy!